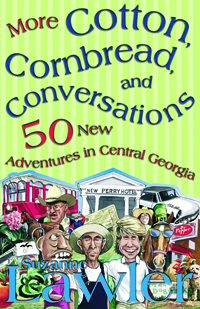 Get ready to jump in the car, buckle your seatbelt, and head out all over Central Georgia, More Cotton, Cornbread, and Conversations is a second survey of some of the best places to visit in Central Georgia. Suzanne Lawler will introduce you to interesting folks from that stretch from Dublin to Sparta, down I-75 to Cordele, and everywhere in between. You’ll get a chance to walk in the woods at Bond Swamp and ground your own cornmeal at Tobler’s Mill. You’ll want to buy vegetables at the Byron market and bid on treasures at the Montrose Auction. Chef Audrey will challenge your taste buds with her sassy sauces and there’s even a chapter for your four-footed best friend. Suzanne scouted high and low to find places that you and the kids will enjoy as you travel for day trips in Central Georgia. And every adventure comes with a logistical information area for quick and easy reference. If you love to hit the road or just don’t know what to do with those relatives that pop into town, just keep the book handy for your next jaunt. You’ll be sure to find something in our beautiful part of the state to entertain, enlighten, and intrigue.